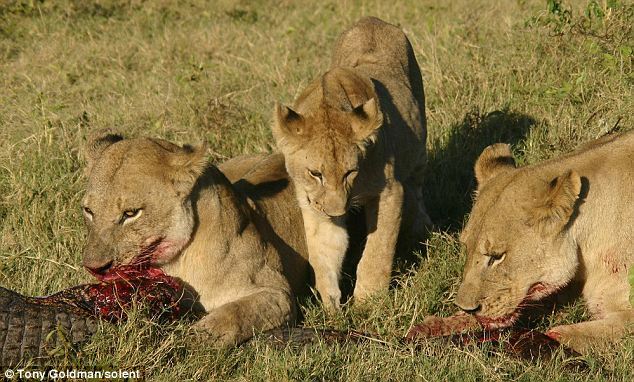 Three lionesses pounced on a crocodile in an extraordinary scene after the reptile tried to attack one of the pride’s cubs. The protective females instinctively leaps into action to fend off the aggressive predator. 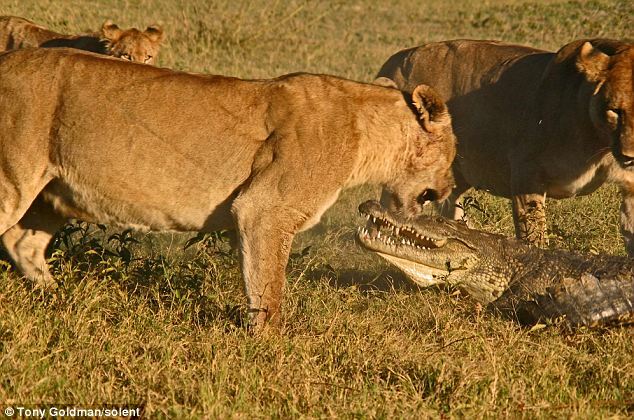 With organized precision, the lionesses surrounded the crocodile and launched a ferocious volley of blows. 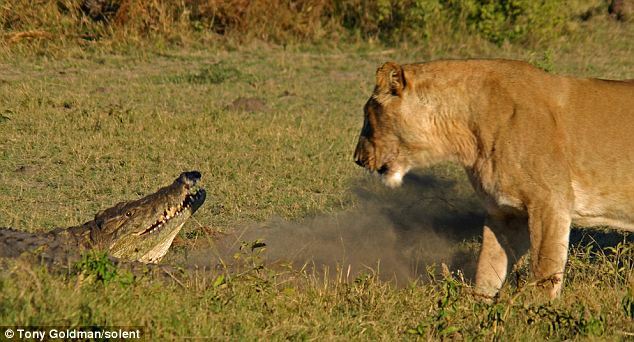 During the encounter the crocodile managed to bite one of the big cats but was soon killed by the pride. 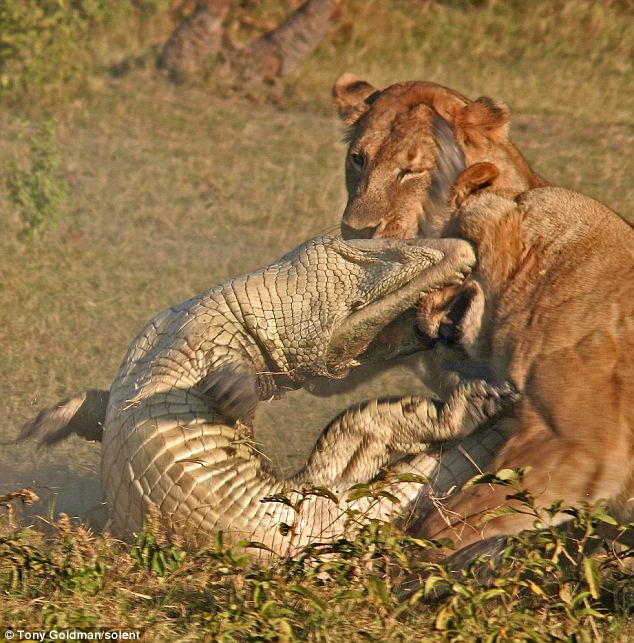 The rare scenes were captured by Tony Goldman while on a safari trip to the Duba Plains, in Botswana, with his son. 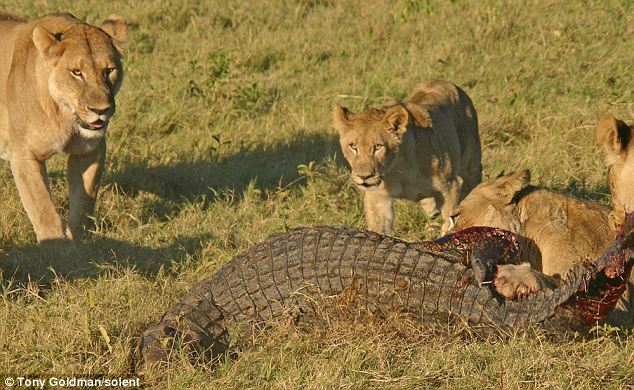 Tony, 58, a cardiologist, said: ‘The lionesses had just killed a buffalo and suddenly a crocodile ventured about 100 yards out of the water towards them to snack on the meat. 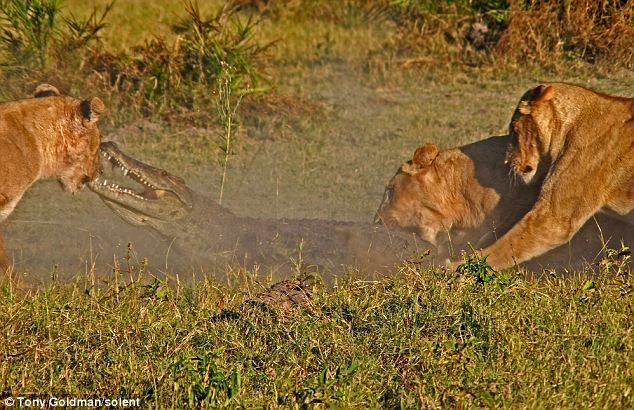 ‘One of the smaller cubs was in the path of the crocodile and it started to advance towards the cub in a menacing fashion before trying to attack it. 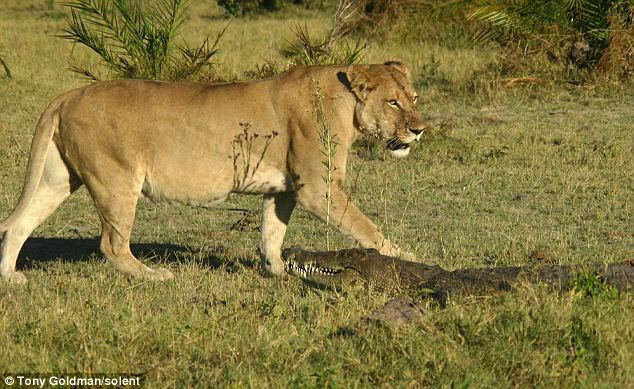 ‘This resulted in an eruption from the three nearby lionesses who went for the croc in an organised fashion. 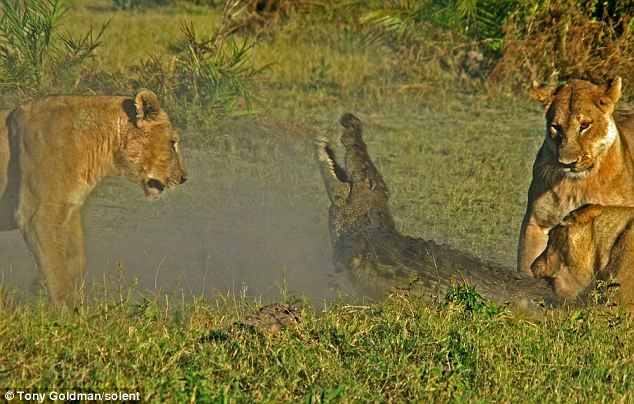 ‘I expected the croc to back off but it didn’t and there was a tremendous fight with the croc biting one of the lionesses. ‘There was a commotion and dust flying everywhere before the lionesses finally overpowered the invader. ‘The whole thing lasted about 15 minutes and was only witnessed by my son, our driver and myself. ‘We were really lucky because the driver had driven like a maniac to get there in time after we heard about the buffalo kill.’ Father of two,Tony, from Benoni, near Johannesburg, South Africa, added: ‘On my subsequent safaris I’ve mentioned this experience to rangers with more than 20 years in the bush and no one has ever seen lions take down a crocodile.